We have been working all summer to prepare for what will be our best year at ACS yet! Here is some information that will help you with the start of the school year. Please don’t hesitate to call with any questions about the start of the year. Most of this information has been already been distributed by mail to students and families. Aug. 14 is Freshmen orientation. From 4-7 p.m. is for students only, parent meeting starts at 6 p.m.
All High School students will be receiving paperwork in the mail in the next couple of days regarding iPad roll out. Students be sure to complete all summer work by the first day of school! OPEN HOUSE: August 21, 5-6 p.m. Title 1 Parent Meeting: Aug. 21 5:30 - 6p.m. Open House: Aug. 20, 5 - 6:30 p.m.
First Day of School for First Graders with last names starting with M-Z: Aug. 27. All First Graders attend Aug. 28. Open House: Aug. 16, 5-7 p.m. The Here Comes The Bus App allows you to see the location of your child’s bus both before and after school, confirm that your child’s bus has arrived at the bus stop, at school or both and receive a push notification or email message when the bus is near. If you are not already using this helpful tool, please learn more about Here Comes the Bus at http://www.herecomesthebus.com. Sign up with School code of 74007. 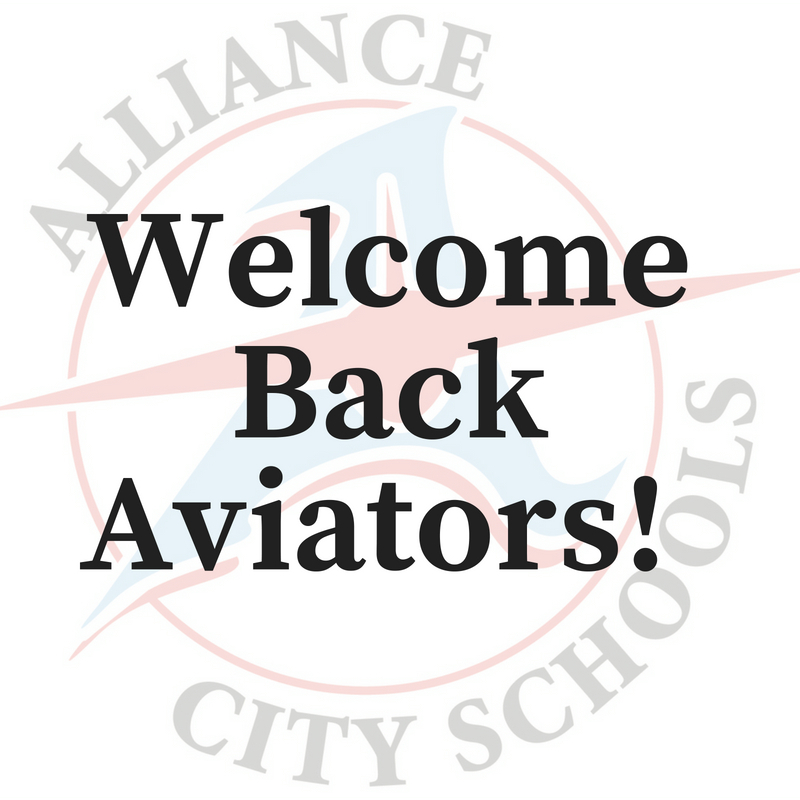 All students at Alliance City Schools are offered breakfast and lunch at no cost. A menu for August is coming soon.